Escape the hard work week, UNDER THE SEA! 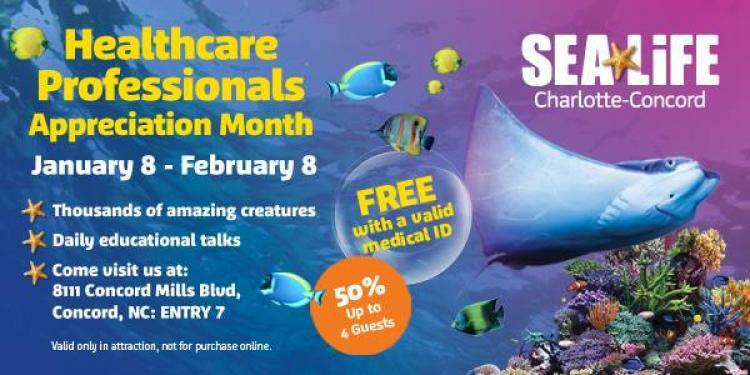 January 8-February 8, 2019, we are offering FREE Admission to all Healthcare Professionals in the Carolinas and 50% off admissions for up to 4 guests. Simply visit our attraction* and show your Medical ID. All hospital employees are eligible as well as all healthcare professionals covering industries such as: dental, orthodontics, speech pathology, social work, and much more. Please see below for a generic eligibility list, but if there are any questions, please message for approval of discount. All Healthcare Employees are welcome! *Offer only valid in attraction, not for purchase online.